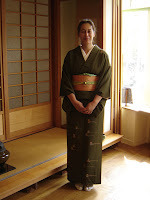 A week ago, Rota and I were supposed to see a tea ceremony demonstration. Rota came to my house so she could see Wolfje and that I could help her with kitsuke. The plan was good, but we had a good time chatting along and because of that we already were late starting kitsuke. Although we did it quite fast, and we didn't get in a lot of traffic on our way to Amsterdam, we were too late... But we still had a lot of fun and had a nice talk with to the Tea Master before we went home. Haha, yes it was too bad you where so late. But the both of you looked so cute. I realized, lucky it didn't rain! The tea area you have above the store is so nice and petite, really lovely. I really had a fun day and we will see a thee ceremony a another time i hope. I also had lots of fun that day!